Life as a new mother drastically changes. Gone are the days of enjoying a long shower or making and eating a bacon sandwich without having to rush to do something. Whatever you choose to do in your day and night time resolves around your baby. You my lovely have been fired out of the equation and that little feeding, sleeping, farting, smiling bundle of joy right there, she’s number one. It’s not that easy. It’s s bit of a task to go have a shower. Being able to have a long shower, listening to music on Heart FM, shave my legs, create shampoo shapes on my hair whilst I sing terribly to music on the radio, is a distant memory now. Now I can do most of that under the watchful and barely interested eye of my 7 week old daughter. I’d love to say I’m at that stage where I can leave her for longer than a particular time period to go and sing my heart out to Bieber but I can’t. Time is poor when you have a baby and Emily is still at that stage where she wants cuddles and constant reassurances that I’m not that far away. Forget being clean. Clean doesn’t cut it when you’ve just come home from the hospital. Want a clean living room? Want a spotless floor? As soon as you step through the door, the last thing in your mind is clean, believe me, even though your house will look like a yard sale within minutes, all caused by baby, you still won’t have time to clear anything up and that’s ok. Don’t panic about it, there’s no point in fretting that your midwife or health visitor may judge, they won’t. Nothing bothers your nose anymore. Well apart from other peoples baby’s poop. But your own baby’s poo and vomit comes in so many different shades and the smell, well, it’s gross but you weirdly get used to it. Daily I stare in wonder at Emily, how beautiful she is, still being surprised that I can’t believe I made this beautiful little human, and totally freaking out when her eyelids begin to flicker. Please, please don’t wake up! They say you should sleep when your baby sleeps and sometimes I do, other times actually most of the time during the day, I don’t. Emily takes a while to get down during the day but is normally great at night to get to sleep. Even if for a few hours. I’d love to say I sleep when she does but the day arrives and I want to do normal human things like see the sunlight, meet friends, get out beyond the four walls and get some fresh air. I’m sure when she gets a little older and sleeps longer hours at night, I’ll be able to enjoy sleep more. Will just have to wait and see. I used to rely on the Daily Mail app to either entertain or bore me to sleep but these days the app is there to trigger my brain with short bursts of no information. I opened an article, read about 3 lines then pass out. All those books I got for Christmas can wait till she sleeps all through the night! I spend a lot of my time thinking about all the things I should be doing and writing lists of things I should be doing but not actually do them due to physical and mental exhaustion. Most of the time it’s at 3am when I’m feeding Emily that I get to watch my catch up TV from my Sky Box which I am os thankful for or I’d never get to watch any of the things I miss. So Emily is now at that age where she’s responding to things. She is 7 weeks ok so it’s nothing to what’s to come in the future but she offers a smile once in a while and full on stares at us while she tries to figure us out. Whilst this is going on, Sam and I try to find ways to entertain her when she’s not on the bouncer or play mat. This is when it feels like I’m impressing a judge that can’t speak but only offers their judgemental eyes as their answer. I’m no Diversity but by Jo I have cracked some pretty amazing moves in the past few days, that’s all I’m saying. ‘You did a poo?’ Mummy is so proud of you. When you have a baby it’s shocking how many of your friends actually stick around and those who just f*ck off. Now that you have a baby, you’re not as important anymore no matter how long you’ve been friends for. For the friends you lose you do gain a solid group of friends who’ll be there for you no matter what through parenthood. No two days are the same, especially at night. 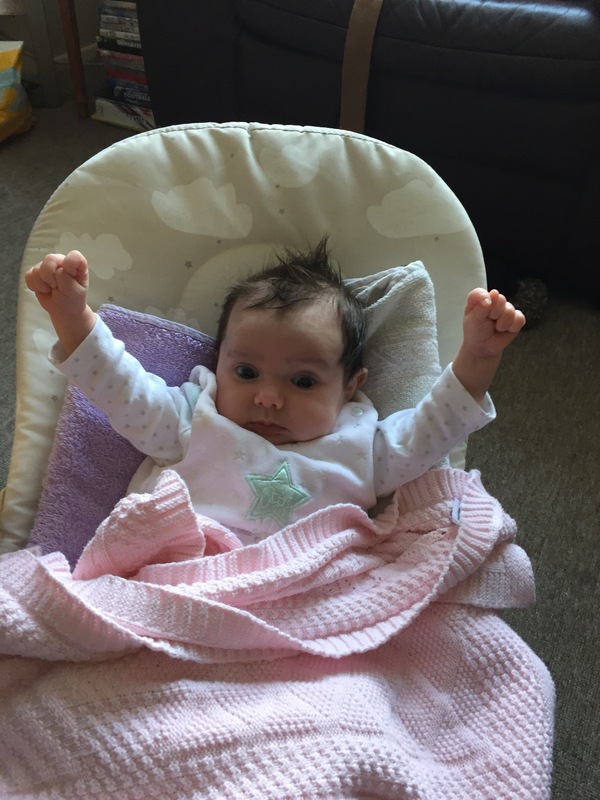 I get super excited when I’ve managed to get a routine in place, emily feeds and naps on time, is bathed, fed and asleep in bed by 10, sleeps 4-5 hours a night and is just a dream of smiles and cuddles. But hang on, don’t pat yourself on the back just yet, that 1-2 days of bliss will change and you’ll wonder what you’ve done wrong. Plenty of mum’s I’ve spoken to have said they’ve sussed it at 6 weeks for it to change moments later and it’s like this till they’re at least 5 years old. Remember that as soon as you give birth, from that exact moment on and for the rest of your life, you’ll never be alone again. Even with 5 minutes of peace when your partner takes over whilst you have a shower, your baby will be on your mind, wherever you are, whatever you do, 2 becomes 1 and that’s pretty damn awesome.